Thermal images, or thermagrams are actually visual displays of the amount of infrared energy emitted, transmitted, and reflected by an object. Because there are multiple sources of the infrared energy, it is difficult to get an accurate temperature of an object using this method. 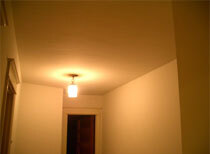 Infrared (IR) cameras are quickly becoming an indispensable tool for home inspectors. Reading the thermal images produced by an infrared camera during an inspection allows for quick and accurate identification of defects that may not always be immediately apparent to the naked eye. 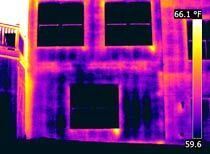 Infrared imaging is especially useful when looking for air leaks, including insulation defects, during an energy audit because it allows the inspector to actually view the apparent temperatures in a given area. While there are other infrared tools available, such as spot radiometers and thermal line scanners, a thermal imaging camera is the most accurate device to use for energy-audit inspections. The camera reads infrared radiation in order to express heat differences and temperature signatures. The camera sees light that is within the heat spectrum that exists just beyond the spectrum that can be seen with the naked eye. Differing heat signatures are displayed in the camera's viewfinder as a gradient color scheme, with hotter areas displayed as brighter colors, and cooler areas as darker colors. 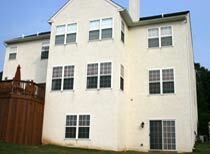 As a result, thermography is particularly useful to building deficiency inspections. A Thermal Imaging Inspection does not take the place of a typical home inspection, but can provide additional valuable information concerning varous defects of the home that cannot be seen with a naked eye. 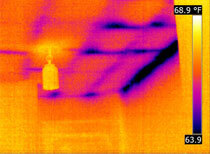 Call us to discuss the added benefits of the thermal imaging inspection.